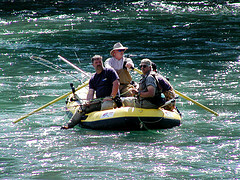 Kenai River Salmon Fishing, Guided Sport Fishing Trips on the Kenai River, Fishing Permits Kenai River, Silver Salmon Fishing on the Kenai River from Soldotna. Choose from a large selection of Alaska Sightseeing and Flightseeing Softadventure Tours from Seward, Homer, Anchorage, Fairbanks and Talkeetna. King Salmon are the largest of all species of Salmon, and it just so happens that the King Salmon entering the Kenai River are among the largest genetic strain of King Salmon in the WORLD! This means that there is always the possibility of catching the next world record, however, your chances of hooking into a fish in the 40, 50 or even 60lb are greater than any river or area in the pacific north west. Fish weighing in from the 30 to 60+ pound range (or larger of course) are what we are after. When a King bites you know it! The rod nearly snaps in half, and the force of that fish pulling on the line can make it seem nearly impossible to hold onto! After you set the hook and you have a good grip on the rod, sit down, tighten the strings and hold on because one of the most thrilling and electrifying tugs of war is about to begin on the end of your line. Ready for some fast action, hard fighting fish that will have our Quantum reels smoking! Than Silver Salmon fishing is for you. 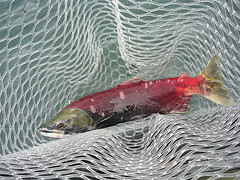 Here on the Kenai we have big fish with major attitudes return every year starting in August. Silver salmon are notorious for great action and lots of fight. The greatest thing about the Silver Salmon season is that they return in the fall (our favorite season of the year), multiple hook ups are the norm, and limits are what we are after. We fish for these silver bullets in a multitude of ways. One of the most common ways to fish for them is to back troll or soak plugs and eggs. Another very popular and one of our more favorite ways of fishing for Silver's is throwing spinners with light weight tackle and spinning reels. This is truly a blast and an absolute thrill for the novice and experienced angler alike. Join us for a special and serene 2-hour float along a non-motorized stretch of the scenic upper Kenai River. 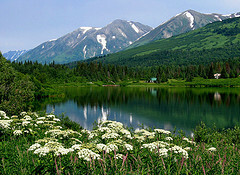 Watch for Moose, Eagles, Dall Sheep, Waterfowl, Beaver and Bears as your guide navigates you through the snow-capped mountain scenery of the Kenai National Wildlife Refuge. Listen to the stories behind the sights: the wildlife, the native inhabitants and early settlers and the forces of nature that shaped the Kenai River Valley. We provide you with rain gear, rubber boots and personal flotation devices. Have your camera ready and enjoy the trip. The trip is suitable for all ages and abilities. Note: The safety standard is high and the company operates these trips since 1977. For those seeking a bit of adrenalin pushing adventure, join us for the fun-filled 7-hour day of exploration into the unspoiled Alaska wilderness that most travelers never see. Start with a scenic river float and a search for wildlife, then ride the Class II spirited rapids through the Kenai River Canyon. 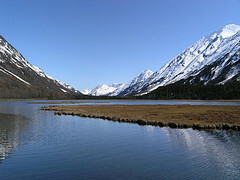 Finish with a cruise along the wild and scenic shore of a glacier-carved lake in the heart of the Kenai National Wildlife Refuge. 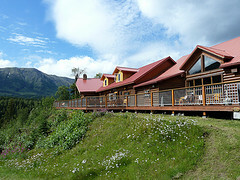 The tour provides some majestic Alaskan wilderness scenery, wildlife viewing and picnic lunch. Maximum 6 clients per raft. We provide rain gear, rubber boots and personal floatation devices. The trip is suitable for all ages and abilities. Note: The safety standard is high and the company operates these trips since 1977. Halibut fishing in Cook Inlet is one of the most productive halibut fisheries in the world. We fish from a 33' cabin cruiser with a heated, enclosed cabin and a private head (bathroom). A wide beam gives this boat a very stable fishing platform with a deep V hull for a comfortable ride. We are powered with twin outboard 225's to get you to the fish fast! Our boat is equipped with state of the art electronics for fish location, navigation and communication. GPS chart plotters make it easy to stay on the fish and navigate in poor visibility. VHF radios are equipped with scramblers to keep our captain one step ahead of the competition. Our boat is one of the fastest in the fleet, putting you at the best fishing grounds within an hour of the launch. Six people can fish very comfortably aboard our boat and we will take no more than six at a time.